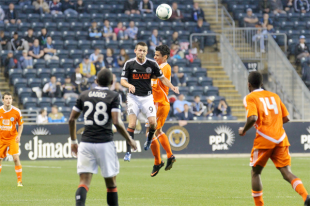 It was ugly but the Union did enough to prevail over Ocean City Nor’easters in the third round of the US Open Cup at PPL Park on Tuesday evening. The Union next face DC United in the fourth round on Wednesday, June 12 at Maryland SoccerPlex. Kickoff is at 7pm. Match reports from PSP, PhiladelphiaUnion.com, The Inquirer, Press of Atlantic City, phillyburbs.com, CSN Philly, SBI, plus post game quotes and video. The Union next face DC United in the fourth round on Wednesday, June 12 at Maryland SoccerPlex. Kickoff is at 7pm. Reading United take on New York Red Bulls tonight in their third round game and the match will be streamed live on the Red Bulls website from 7:30pm. Look for our preview later this morning. More match previews from Reading United, New York Red Bulls (video), Once a Metro, The Hoya, and guhoyas.com. Reading Eagle talks to some former Reading United players, all of whom are proud the team has reached the third round. Former goalkeeper Ian Christianson, who is now with New York, expects a 3–1 Red Bulls win. Big Apple Soccer has US Open Cup related articles on New York’s Connor Lade, Ryan Meara, and Digao. With Colorado eliminated by Orlando and San Jose knocked out by Charleston, MLSsoccer.com wonders if any of tonight’s cup ties will see more MLS sides out of the tournament. Sebastien Le Toux comes in at No. 12 in the latest Castrol Index Weekly Top 20. In the Full Castrol Index, the top five Union players are Jack McInerney (No. 2), Sebastien Le Toux (No. 49), Amobi Okugo (No. 63), Conor Casey (No. 71), and Michael Farfan (No. 129). Looking back at Saturday’s loss to Montreal, Zolo Times sees a lack of effort and concludes, “There is a looming crisis with this team,” that crisis being a lack of confidence. More power rankings! At MLSsoccer.com, the Union fall two spots to No. 13, which is also where ProSoccerTalk has them. Hmmm. More on Danny Califf not getting any playing time in Toronto. Hmmm. Following their 2-0 loss to Richmond last Friday, Harrisburg City Islanders fail to land a player on the USL PRO Team of the Week for the first time this season. Yann Ekra received an honorable mention. Harrisburg’s Tom Brandt hopes to return from a hamstring injury this weekend. Surprise! Marco Di Vaio is the MLS Player of the Week. Reuters reports that David Beckaham “will visit Miami this week as he steps up his interest in owning a new Major League Soccer (MLS) team.” It will be a terribly unfair turn of events if Miami gets a MLS franchise before Orlando. At Goal.com, Seth Vertelney has a USMNT to-do list for the five-game series of friendlies and World Cup qualifiers that begins tonight. Soccer America and MLSsoccer.com on Jurgen Klinsmann’s announcement that he will go with a new midfield pairing tonight in Jermaine Jones and Sacha Kljestan. It will be Kljestan’s first start under Klinsmann. At ESPN, Jeff Carlisle looks at the USMNT’s lagging attack while Roger Bennett profiles assistant coach Martin Vasquez. The Cleveland Plain Dealer has stories on Clint Dempsey and Belgium’s upward trend in the world soccer ranks. More on the Belgium team from SBI and ProSoccerTalk. DaMarcus Beasley could earn his 100th cap for the USMNT tonight. The Guardian looks at how US national team players fared in Europe over the 2012-13 season. The USMNT U-20s fell 4-1 to France U-21s in the opening game of the Toulon Tournament. The Daily Journal checks in with USWNT goalkeeper and Vineland native Jill Loyden. Today’s matches include Germany vs. Ecuador (2:30pm: ESPN2, ESPN3) and England vs. Ireland (3pm: FSC, Fox Deportes). John Hackworth continues to lie to all of us, he is a joke. I was at the Orlando City v Colorado Rapids match last night. It wouldn’t be that much of a shock to see them beating their MLS affiliates in the next round. I’m so torn because I feel the Open Cup the Union’s only chance of achieving anything meaningful this season, but I’d also love to see Orlando stick it to Garber by booking their spot in the Champions League. It would be such a needless slap in the face to see any other city (especially one in Florida) awarded with an expansion franchise before Orlando. Orlando seems to be doing everything right. They have a team, good management and, from what I have seen thus far, a solid fan base. MLS awarded Philly a team when we ONLY had a Supporter’s group (no pre-existing outdoor team). Seattle, Vancouver and Montreal already had a pre-existing team and good support for a lower tier league. Orlando has a plan for a stadium, which is more than D.C. and New England can say. Hell they gave NY a franchise despite having none of the criteria above. If MLS moves in that direction again and chooses Miami, w/ or w/o Beckham, it would be a slap in the face to not only Orlando but some of the strongest MLS Supporters. If the team fails to draw fans or succeed on the field it would ruin their reputation. If MLS really wants Miami then package the two to keep the league even at 22. I gotta vent. OC is putting 10 players behind the ball last night, hoping to counter as the U nurses a one goal lead and Hackworth’s first sub is CRUZ, DANNY FRIGGIN CRUZ. At no point should it ever enter Hack’s mind that CRUZ is the right sub at that moment. The limited positives that CRUZ brings (speed, philly tuff, drawing a blank…)do not translate to being affective in that situation. He marauded down the right side like a Tasmanian turnover machine. He killed our width by clogging William’s lanes and turned the ball over repeatedly with his poor first touch. I’m not here to kill Cruz, good for him for playing and earning a pay check. But the manager has to be able to understand where the game is, how it is being played, and what subs can be affective in those specific situations. Hack’s personnel management is bad enough, but his in game managing is unexplainable. I was literally routing for OC to win at that point and I’ve been a season ticket holder since ZOLO. I hate what this team has become. No, but I heard the giggles when Cruz was absolutely SMOKED by a Nor’easter in a footrace. I am starting to believe that Hack actually believes HARD WORK actually trumps ability and intelligence. In regards to Roger Torres and Danny Cruz I always felt a twinge of sympathy for the Unions marketing and PR staff as they try and figure out why people like Roger Torres and hate Danny Cruz. Then they drink themselves into a stupor and cry themselves to sleep. Only 14 players that are still currently with the team have played measurable minutes this year (more than 100). 14. Hoppenot’s 236 is the least among those, and Kleberson has 255. That’s the same starting XI, and the same 3 subs EVERY game. I went through the stats on MLSSoccer.com and every other team had at least 16 players that have played at least 90 minutes this season. If we count Soumare and Garfan we meet that total, but they are no longer here. It is very concerning to me that we have no where else to turn. Torres wasn’t even in the 18 for Tuesday’s match, and all 3 subs were players we normally see in league action. There is NO ONE ELSE. We’re not hiding our DP on the bench, and we don’t have a high paid center-back nursing an injury anymore. What we saw Saturday and Tuesday is it. This team needs help really bad. Lots of help. And draft picks aren’t the answer, unless Hackworth is planning on a 3-year building project, which we’ve already re-started twice. Cruz has a ton of deficiencies, but he does generate desperately needed chances. His run led to the corner that won this match. It is easy to get frustrated watching him not finish the chances his runs often create, but at least he is making runs in the right places. Not sure anyone else in this roster can. Funny interview there. Kleberson got Fernandes’s autograph, LOL.